HostSiete Review 2019: Is HostSiete a Good Hosting? HostSiete is an Argentinian web hosting provider established in 2010, with a focus on designing an intuitive, simple, and yet affordable web hosting platform that’s ideal for beginners. HostSiete is a web hosting provider based in Buenos Aires, Argentina. They markets themselves as a powerful, safe and simple web hosting vendor for both individuals and businesses. HostSiete has been providing high quality domain and hosting management services since 2010. The company’s website primarily serves an Argentinian customer base and is only available in Spanish. The caveat is that because HostSiete caters to beginners, they don’t have any plans for more advanced users — or even users with multiple websites. All of their plans are limited to a single domain name (the cost of which isn’t included in the package, by the way) and go up to a maximum of 30GB SSD storage and 30Mbps bandwidth. The latter is pretty restrictive if your website ever grows in popularity: essentially, if there are more than a dozen visitors checking out your website at any given moment, they’re going to experience a slowdown in website loading speeds. One feature I was particularly impressed by was Brizy, their WordPress-based website builder. WordPress can be particularly challenging for beginners to set up, since it requires users to have some degree of technical and coding knowledge to install and customize the themes. However, in line with their core vision of creating a simple, beginner-friendly platform, HostSiete has enabled the one-click installation of WordPress and employed the help of this website builder to lower the barrier for beginners. 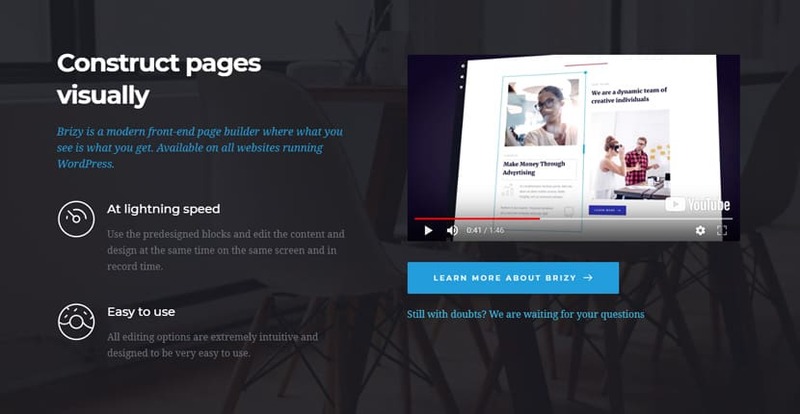 Brizy allows you to build a beautiful WordPress website visually, meaning you no longer have to understand code to make any changes to your WordPress themes. HostSiete offers affordable web hosting plans for individuals and businesses in Argentina and beyond. The different packages you’ll find mostly vary by the disk space and transfer speeds allocated. You can choose to pay the vendor on a monthly, quarterly, biannual, annual, or even a biennial basis: the longer the billing period chosen, the greater the discount you get. Do note that all prices are listed on the HostSiete website in Argentinian Pesos, so if you’re a foreign customer, you’ll have to do a bit of currency conversion. As previously mentioned, HostSiete isn’t the best for companies with multiple websites or larger amounts of traffic — their plans are definitely amongst the most inexpensive in the market, but once you get past a certain level of unique visitors per week, you’ll have to start searching elsewhere to scale up your hosting plan. The company does not have a free hosting plan or a money back guarantee, but they offer a free seven-day trial, allowing you to cancel anytime. Perhaps because of the vendor’s decision to target beginners, everything on the platform is made with this demographic in mind. The platform is super intuitive and minimalist, including the process of switching from one plan to another. Unfortunately, one of the biggest aspects people who have used HostSiete complain about is the company’s support team. One big letdown is the fact that their customer support is only available via a ticketing system. It’s not uncommon to find a queue of open tickets accumulating with long wait periods for any resolution. While the support team is polite, helpful, and professional, they sometimes appear understaffed. It would definitely help a great deal if HostSiete would add live chat, email and over-the-phone support. All the same, it’s not all doom and gloom. In fact, the company has created a ticketing system that allows for tracking, so that it can be clear to a user just how far away they are from being attended to by the support team. My experience was quite similar to that of many other users, waiting for days before my issue was addressed. However, when I finally got in touch with the support staff, their patience, resourcefulness, and friendliness was definitely up to standards. HostSiete’s user platform is beginner-friendly and affordable for their Argentinian customer base. However, the lack of scalability and slow support response times may prove challenging as businesses grow. Wondering how HostSiete stacks up against other Web Hosting companies? Enter any other Web Hosting company and we will give you a side-by-side comparison.